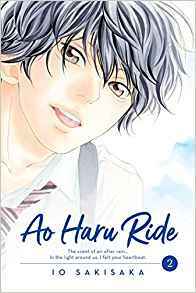 When reading the second volume of this series, I found myself thinking about how the characters in Ao Haru Ride are different from some of the unusually self-aware protagonists that occasionally appear in shoujo manga. Teens with involved thoughts about the condition of being teenagers are fairly common, but Ao Haru Ride is concerned with issues of time and memory, and how memory can be a constructed choice in a way that feels refreshing to me as a reader. As Futuba enters her second year of high school, she still struggling to find her niche. Her attempt to ingratiate herself with a small gang of judgemental girls didn’t work out well for her, and she wants to develop real friendships. She makes a point of being friendly to Makita in an attempt to head off a resurgence of rumors and finds herself a topic of gossip. Joining her and Makita in the new class are the enigmatic girl Murao, the boisterous Aya, and Kou. Futuba decided to throw herself into class leadership after hearing about a school-sponsored leadership retreat, and she’s joined by her new classmates. Kou isn’t too happy when he realizes that he’s signed up for a trip that his older brother Tanaka is overseeing as a teacher, but he and Futuba reach a sort of understanding about their previous middle school crushes, as he warns her that he’s different now, and she starts appreciating Kou in the present without expecting him to match up with her memories. Futuba is also extremely conscious of making new memories on the trip, as the not-quite-friends-yet group goes through the typical outdoor activities to encourage class bonding. She makes sure that everyone gets together to watch the sunrise, knowing it is the type of memory they will treasure later.Ao Haru Ride’s are unusually insightful and self-reflective, which makes this a shoujo romance manga with so much emotional depth. Kou points out to Futuba that things come easier for him because he just doesn’t care about anything, and the fact that she’s struggling to make things better means that she’s a better person than he is. Futuba in turn notices all the times that Kou’s innate kindness shows through his acerbic exterior. This series is inching up the list of my all time shoujo favorites after the fourth volume. There’s the potential for more drama to develop as the new group of friends starts to come together, but with Kou and Futaba being such uniquely thoughtful protagonists, I’m looking forward to seeing how they deal with all the issues of high school life. Ao Haru Ride is such a special series, I’m glad to have the chance to read it.